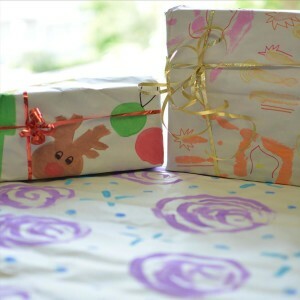 Often when a child receives a gift they are thrilled and shriek with excitement whilst playing with… the wrapping paper. Children just have this intense fascination with wrapping paper and presents. The idea of gift giving and receiving is one we learn and enjoy from a young age. Why not make your gifts that little bit sweeter with some personalised, handmade wrapping paper made by your little one (or big one). This activity is fun, simple, thoughtful, sustainable and creative! What’s not to love? Bring out the wrap star in your children! Choose a design and get creating! Wrap your gift, using the ribbons to decorate!